This is my third time doing business with them, The quality of their led screen is very stable, and have a intimate after service! Full color indoor P3 LED screens with 3in1 SMD full color LED block modules as unit is another deeper revolutionary development in the LED screens industry. It shows a super fine and high quality picture on the LED screens and has a much wider viewing angle than the full color dip lamps LED screens. It rejects the deficiencies of the traditional LED lamp outdoor display screens. 1. these serial creative products are ectension design from LED ultra slim indoor display. 2. slim and light weight cabinet design. 3. aluminum alloy material, light weight, only 6kg/pc. 4. hanging structure design, fast installation. 5. front maintenance, easy to maintain. 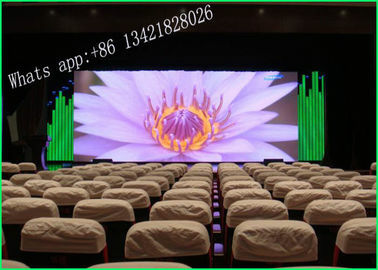 LED display,also called led screen, led video wall, or led sign, with its unique advantages,has gradually replaced the traditional billboards, light boxes,etc. LED display advertising has become a new force in the media industry. Traditional advertising can only show pictures, But LED display/led video wall/led screen can perfect combine text, pictures, video, and sound with high resolution,high brightness and full color! LED display Advertising screen can easily attract the attention of pedestrians,and also are easy to remember,which can generate greater advertising effectiveness. 1) Free 2-year warranty. Life-long maintenance, only needs to anew purchase the raw material when outside the warranty period. 2) 7*24 service, any questions will get reply within 1 hour. Problems get solved in 12 hours. China Good Quality RGB LED Screen Supplier. Copyright © 2016 - 2019 rgbledscreen.com. All Rights Reserved.